Three-time champion Djokovic squeezed in his last-scheduled match on No. 1 Court on Wimbledon’s `manic Monday’ just before darkness stopped play. As he answered questions in the Serbian portion of his news conference after his victory over Karen Khachanov, Djokovic – via a translator – bemoaned the fact that his great rivals Roger Federer and Rafael Nadal have played all of their matches so far on Centre Court. Only a near-perfect performance from the 12th-seeded Djokovic wrapped up the victory in just 1 hour and 46 minutes, ensuring the match wasn’t carried over to Tuesday. If Djokovic is put on Centre Court on Wednesday, that would mean one of the top-ranked duo – eight-time champion Federer or two-time champion Nadal – playing on No. 1 Court. Due to its roof, matches on Centre Court can continue when either darkness or rain interrupt play on all other courts. A roof on No. 1 Court is expected to be completed in time for next year’s tournament. As she seeks a first Wimbledon title, Timea Babos was handed a boost when it was revealed that she will become the new top-ranked women’s doubles player. Juan Martin del Potro wasn’t as efficient. His fourth-round match against Gilles Simon was suspended because of bad light after the fourth-seeded Argentine lost the third set. Wimbledon’s Centre Court roof has closed for the first time in this tournament. Williams is looking for her eighth Wimbledon title and has established herself as the big favorite once again, with the top-10 seeds all eliminated. She is seeded 25th after missing last year’s tournament while pregnant. Mannarino won only one point on his own serve as Federer hit 11 winners to just one unforced error. The only consolation for the 22nd-seeded Mannarino was that he became the first player to earn a break point on Federer’s serve during the tournament. The last of the women’s top-10 seeds has been knocked out at Wimbledon. Bertens hit seven aces and saved eight of the 10 break points she faced to win 6-3, 7-6 (2) and complete the latest upset in the women’s draw. She beat the ninth-seeded Williams in the third round after coming from a break down in the third set. The 12th-seeded Ostapenko was aggressive throughout, hitting 28 winners – 13 coming off her backhand. The 21-year-old Ostapenko, the youngest player remaining in the women’s draw, next faces 33rd-ranked Dominika Cibulkova of Slovakia. Leading 5-4 and two points away from taking the first set at 0-30 on Hsieh’s serve, Cibulkova struck a backhand onto the baseline that was called out. Hsieh protested, leading the match referee to come on to discuss the decision with the umpire as calls of ”replay the point” came from a bemused crowd on Court 18. The only remaining top-10 seeded woman, No. 7 Karolina Pliskova, was trying to avoid further upsets as she faced Kiki Bertens of the Netherlands. Other early starters included No. 12 Jelena Ostapenko of Latvia facing Donna Vekic of Croatia and Camila Giorgi of Italy playing Russia’s Ekaterina Makarova. The so-called ”Manic Monday” sees every remaining men’s and women’s singles title challenger play their fourth-round matches, making it one of the busiest days of the championships. 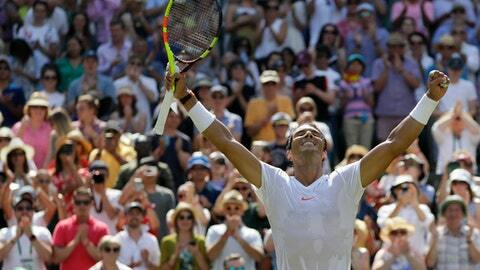 Wimbledon is set for its annual ”Manic Monday” as the fourth round gets underway at the All England Club. All remaining men’s and women’s singles title challengers are in action, with a Centre Court lineup that includes Roger Federer, Serena Williams and Rafael Nadal.